The belief in scientific objectivity had been shaken in 1927 when physicist Werner Heisenberg enunciated the "uncertainty principle," which held that in subatomic physics the observer inevitably influenced the movement of the particles being observed. LSD research and many other types of studies suggested that an uncertainty principle of sorts was operative in psychology as well, in that the results were conditioned by the investigator's preconceptions. The "pure" observer was an illusion, and those who thought they would conduct an experiment without "contanimating" the results were deceiving themselves. Last month I suggested 'the only Matthew Passion is the one you are hearing right now. Savour it, because it will never sound the same again'. The quote above from Acid Dreams by Martin A. Lee and Bruce Shlain, a book which also featured here recently, offers thought provoking support for my thesis. At this point the obvious path to follow is the one that leads to the chance music of John Cage and his followers. So why does my header image show an LP of music written thirty years before Cage started experimenting with the I Ching? Quite misleadingly, uncertainty in music is automatically associated with a small, but highly influential, group of 20th century composers. In fact uncertainty has been a feature of music since medieval times, when the earliest rudimentary scores meant the music never sounded the same twice. In the Baroque era Louis Couperin pioneered the unmeasured prelude, in which the duration of the note is left to the performer - see below. 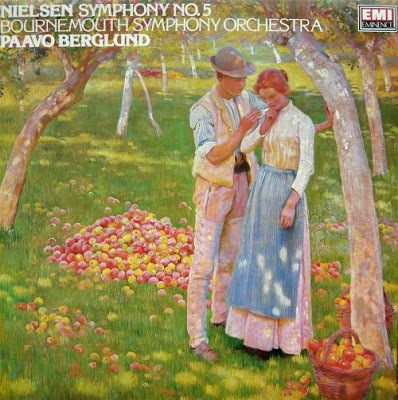 My header image shows an LP of Carl Nielsen's Fifth Symphony, a work which Deryck Cooke described as the greatest symphony of the 20th century. Despite this acclaim Nielsen's music has suffered the unfortunate fate of falling down the crack between romanticism and modernism. Although two of his symphonies (4 & 5) have found a place in the repertoire, much other great music remains neglected, including his three fine concertos. Why, oh why, isn't the gorgeous Violin Concerto played more often? Nielsen's art seems more affected by the breakdown of the values and the subsequent disintegration of musical language that distinguishes the period. Nielsen's Fifth Symphony has been well served by the record industry. I grew to love it through the long-deleted 1975 LP seen above. Producer David Mottley and engineer Stuart Eltham captured the Bournemouth Symphony Orchestra conducted by Paavo Berglund in that wonderfully rich yet realistic sound that was the hallmark of EMI's recordings of the period. Simon Rattle said of Berglund "He is one of the great conductors still among us", an opinion I will happily concur with. I remember a blistering Shostakovich Seventh Symphony in the acoustically magnificent Caird Hall in a freezing Dundee in the 1980s, with Berglund conducting the Royal Scottish National Orchestra. Paavo Berglund's 80th birthday passed unnoticed on April 14, 2009. The reason is not difficult to find. The Finnish maestro has never been part of classical music's PR circus. One lasting memory of Berglund is his Shostakovich in an arctic Dundee. Another is an appearance by him on BBC Radio 3's In Tune programme a couple of years back. Presenter Sean Rafferty was in the studio in London, Berglund was being interviewed over a line from Scotland where he was conducting. Sean Rafferty asked his usual fawning and vacuous questions. Berglund refused to answer in anything but monosyllables. As Berglund became more taciturn Rafferty became more voluble (if that is possible) until the interview ground to a halt. If it was available on CD it would be a best seller. As I write the CD transfer of Jascha Horenstein's 1971 Nielsen Fifth with the New Philharmonia Orchestra plays. If you need proof that this is one of the great symphonies of the 20th century and that both Ukrainian-born Horenstein (who died in 1973) and Berglund are seriously underrated conductor, look no further than this CD. 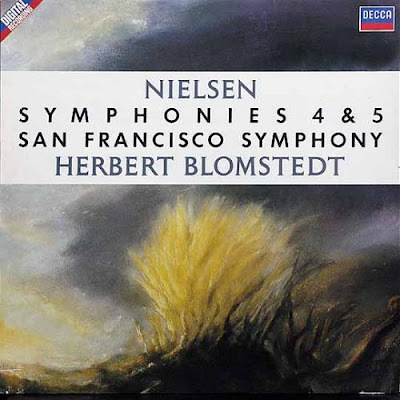 My other personal favourite among the Nielsen Fifths is Herbert Blomstedt's 1988 account with the San Francisco Symphony. But he recorded it for Decca. So uncertainty prevails and this fine version, seen below, is currently out of the catalogue. And, to prove there is no such thing as objectivity, an email pops up as I type. It announces the launch of the San Francisco Symphony's own social network "where musicians and music fans can meet each other". Sounds just like what used to happen in concert halls to me. To take this path full circle, the Nobel Institute biography of proponent of the uncertainty principle and Nobel Laureate Werner Heisenberg makes interesting reading. He also headed the prestigous Kaiser Wilhelm Institute for Physics in wartime Berlin, listed classical music as one of his hobbies, was a distinguished pianist, and worked with the nuclear physicist Lisa Meitner. As Carl Nielsen was composing his Fifth Symphony in Denmark, Heisenberg and Meitner were working in Germany, and the time of what Robert Layton described as "the breakdown of the values" was fast approaching. Lisa Meitner did not go on to work with the Nazis, in fact she publicly criticised Heisenberg for doing so. Neither was she awarded a Nobel Prize, although many say she should have been. The full story is in Lisa Meitner, the forgotten Lady Atomic. Interesting to note that in those pre-CD times there was no coupling on that 36 minute LP of Nielsen's Fifth. But, it was on EMI's mid-price Eminence label! "the "uncertainty principle," which held that in subatomic physics the observer inevitably influenced the movement of the particles being observed"
My (modest) scientifuc training is a good number of years in the past, but I don't believe that's what the uncertainty principle is about. As I understand it, the principle actually analyzes the precision of a pair of measurements (often momentum and position of a particle). As we increase the measurement precision for one, precision is lost in the measurement of the other. This is independent of the effects of an observer. In other words, the principle does not deal with observation, but with measurement. I think it's being confused here with the "observer effect," which most often deals with interference from the instruments used by the observer to perform the measurements. "... in that the results were conditioned by the investigator's preconceptions. The "pure" observer was an illusion, and those who thought they would conduct an experiment without "contanimating" the results were deceiving themselves." This may or may not be valid, but I can't see why measurement realities for subatomic particles should be comparable to experiments in human psychology, other than a a pretty fuzzy metaphor. Overall, my unease is that "quantum effects" and "uncertainty" seem to be frequently invoked in areas such as "new age" philosophy, "active water," massively expensive audio gadgetry, and various pseudoscientific healing/wellness claims. I've even seen "quantum effects" used to explain dowsing and the appearance of ghosts. Generally, the use of "quantum" in areas other than physics is only intended to impress with jargon, and it's not hard to find such "extracurricular" uses debunked in some detail. But I did enjoy the rest of the piece! Scott, I think you are broadly correct. The authors of Acid Dreams, where the quote is from, were almost certainly fuelled by more than caffeine. The uncertainty principle is often explained as the statement that the measurement of position necessarily disturbs a particle's momentum, and vice versa—i.e., that the uncertainty principle is a manifestation of the observer effect. Well ... even if the scene-setting quote had referenced the observer effect, I still would have been contrary enough to have objected to it. The observer effect talks about real physical effects in the measurable world, and I still have a problem with the metaphor (analogy?) that applies this to subjective comments about a listener's experience of music. But when you come right down to it, I just don't feel that experiencing music needs or benefits from this sort of fuzzy, vaguely "new age" sort of discussion. My feeling is heightened by all of the ways in which quantum effects and uncertainty/observer effects are misused in support of various bits of pseudoscientific nonsense. I recognize that you're quoting the passage I'm picking on, not writing it, and that it would not be fair to tag you with belief in everything that's quoted here. However, I'm uneasy seeing this as the intro to an article in a blog which I value as much as any!